Not the wedding gown, but the dress in the upper corner. I thought it would be nice to do in a dark purple. SyFabrics.com had this Plum L'Amour Satin for $4.99/yd. 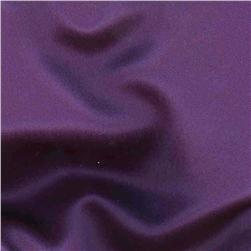 And Fabric.com had this Amethyst Duchess Satin for $8.98/yd. 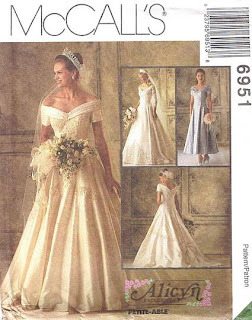 So, I've been looking at the instructions for that dress and come to find out, it calls for "bridal loops" which is a row of loops on a tape used for all those little buttons you see on the back of wedding dresses and other higher end fashions. Since I'll be changing in the bathroom at the hotel from the semi formal daytime event to the formal evening event, I don't really want to have to ask random strangers to button me up. So, I'm trying to figure out how to put in an invisible zipper. Believe it or not, I've done very little with zippers and I've never put in an invisible one. It seems pretty easy. I found this website about how to sew an invisible zipper with nice drawings to help illustrate. The dress also calls for horsehair braid which I've never used before, but I also found this website about how to apply horsehair braid to hemlines, with photos. Anyway, I ended up finding a lovely formal gown in a light blue at Value Village for $20. It needs a little work, but I feel like I have much more time to make alterations and decorate a dress than to build one from scratch. I'll take photos and post about it when I get started.